Search for articles on credibility and you will be inundated with hundreds of articles about how to build your credibility or repair it if it’s been damaged. What most of the articles fail to talk about is that credibility is a two-way street and that strong relationships need credibility on both sides. Credibility is a cornerstone of influence. Both possessing it and identifying it in others. If we wrongly assess the credibility of someone when we are trying to influence a situation, we can easily end up devoting lots of resources to influencing someone who just can’t deliver what is needed. In their seminal work on leadership, James Kouzes and Barry Posner identified three key aspects of credibility which they developed in their later book devoted to the topic. All three act as a good way of identifying how you will be perceived by the other person but also as a way of assessing how credible the other person is in relation to the situation you are trying to influence. It’s important to understand that credibility can change significantly from situation to situation and that while we might have credibility in some circumstances, in others we can risk damaging our relationships by overplaying our credibility. The same can be true about the person we are trying to influence. They may be highly credible in some situations but are they credible in this one? Outright lying takes place in most walks of life but what is much more common is a lie to cover up a lack of knowledge or understanding. I remember quite early in my military career being told that if I didn’t know the answer to a question I should reply confidently as if I did. I remember at the time being aghast at this advice and I’ve always advised people to do the opposite. If you don’t know what a client, co-worker or manager wants to know, then being caught bluffing your answer is the quickest way to damage your credibility and the most difficult to respond to. This works both ways though and ensuring that those who you work with know that you would much rather they told you they didn’t know an answer rather than bluff, you can help to prevent damaging a relationship. Understanding how much skill and knowledge someone has in a particular field can be key to identifying how credible they are in that area. In business it’s easy to spend time focusing efforts on someone that we get on well with and who is truthful with us. If they don’t have the expertise to deliver what we need in a particular situation then this can represent wasted effort. This doesn’t mean that we should ditch this relationship, more that to influence this situation we need to focus our efforts elsewhere. When we are trying to exert influence over a situation, this can also be the time to accept that we may not be the right person from our own organisation to influence the situation. Do we need to put our own ego aside and find someone more credible from an expertise point of view to represent us? Sometimes to build the most credible perception of our organisation we may want a joined up approach, bringing in expertise to bolster the overall credibility. Someone can always tell the truth and be a top of their field expert but if they lack the dynamism to deliver then they still lack credibility. The same stands true for ourselves – if we don’t deliver what we have said we will, our credibility will suffer. Asking someone questions about their dynamism (or lack of it) can often fall into the ‘uncomfortable conversations’ bracket, particularly in a client relationship. Building a relationship to a stage where we can have frank discussions about our ability and desire to do something that’s been asked of us, can hugely strengthen that relationship and increase our influence. 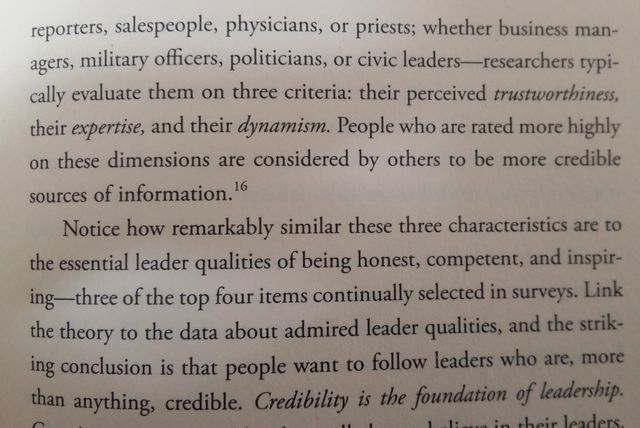 Reflecting on how these three factors relate to the situation that we are trying to influence, can help us improve our credibility. We might choose to alter how we talk about something to ensure that we are seen as completely truthful – the humility to accept that things aren’t perfect can be highly effective in the right circumstances. Alternatively it might mean that we accept that we don’t know all the facts but can demonstrate our dynamism by finding out and getting back to the person we are trying to influence. Do we need to improve our expertise in an area or find someone who has this to provide us with organisational credibility? We can also use this framework to ask ourselves how well the other person is displaying these characteristics and if they aren’t, then how does it affect the situation we are trying to influence. Are we wasting our time if they aren't dynamic to deliver what we're discussing? Do they have the expertise we need to resolve the situation or do we need to get them to introduce us to someone else within their organisation? Questions such as these can help us develop how we think about what it is that we are trying to influence.